Unlike many fans of Nintendo’s iconic consoles, the GameCube doesn’t hold a special place in the nostalgia-filled video game portion of my brain. That said, I can’t help but appreciate this clever Nintendo Switch dock (seen above). 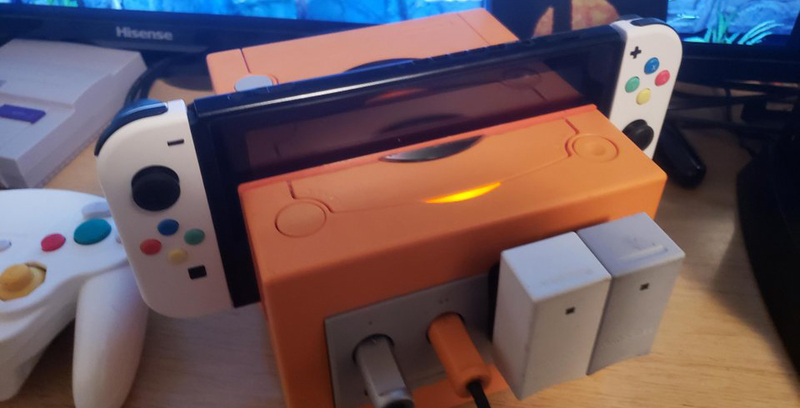 The DIY project made by Reddit User ‘Littlewolf128‘ features a modded GameCube that works as a Nintendo Switch dock. Taking things a step further, the makeshift, DIY dock also features working GameCube controller ports. Given that Nintendo’s Smash Bros. franchise and the GameCube’s famous controllers have gone hand-in-hand since the classic system’s first release back in 2002, this will likely come as good news anyone who recently picked up Super Smash Bros. Ultimate for the Switch. Of course, you could always pick up one of the various options out there that allow you to plug classic GameCube controllers into the Switch, or even just a version of the controller that’s compatible with the Switch, but what would be the fun in that. To be clear, this isn’t the first time we’ve seen a GameCube Switch mod like this, though it does seem to be the most polished that’s appeared so far.